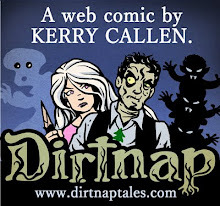 Kerry Callen's Blog! : Galactus' Helmet Just Gets Happier and Happier! 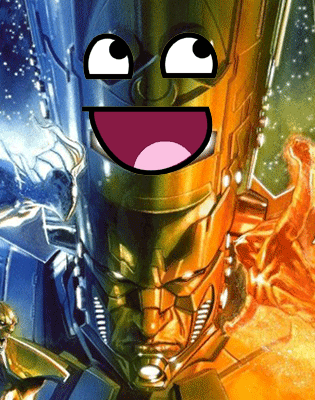 Galactus' Helmet Just Gets Happier and Happier! When Jack Kirby first revealed Galactus at the end of Fantastic Four #48 in 1966, his helmet top basically resembled an unenthused Kermit the Frog face. By the time Alex Ross was painting him for Marvels in 1994, Galactus' headwear had been de-kermitfied, and was getting a little cheerier, like a happy monkey. In 2007, as Gabriele Dell'Otto portrayed him on Annihilation: Heralds of Galactus covers, his helmet has gotten downright giddy! 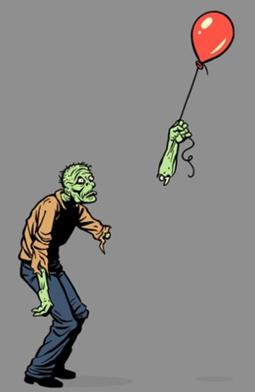 This rocks in a disturbing and humorous fashion! I love the monkey one! Priceless!! 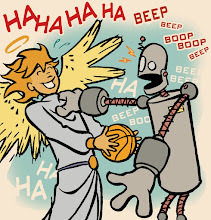 It makes me want to write a story titled "So Laughs Galactus!" or something. I think it would be a contest between Galactus and Black Bolt to see which can make the other laugh first. It would end with Galactus finally doubling over in laughter when Black Bolt gets Lockjaw to hump the Fantasticar (Mark I model). When I was in college, I got Rick Stasi to draw me a color portrait of Galactdux, which was my idea for a Howard the Duck story. He rendered it Kirby-style with the reaching hand and everything. It's still pretty cool. I think the idea of someone trying to make Black Bolt laugh is brilliant! Hmm ... you know, there is something there. Maybe some third-rate super-villains bent on destroying reality (heedless of injuries to themselves) decide to try that tactic. As Jack Kirby spins in his grave so fast he drills down to China. Possibly. But I suspect it would be more over this. I'm never going to un-see that now, am I? That's awesome! amazing eye for detail. What I love about the early Galactus is the big "G" on his chest. It's a great helmet. It's really amazing. I think it's important for everyone.Thanks for sharing. The Greatest Super-Villian Weapon Ever?